You probably know that it’s just as important to keep existing customers as it is to acquire new ones, but when it comes to the investments required for both, which has the bigger payoff? The higher your customer attrition rate – also known as customer churn – , the lower the likelihood of growing your business. Churn is typically calculated by dividing the number of customers you lost in a quarter by the number of customers you started that quarter with. Study after study shows that when it comes to retaining versus acquiring customers, customer acquisition costs far exceed those related to customer retention. The cost of acquiring new customers is so high that your bottom line suffers if you’re losing clients at a high rate. First though, you have to examine what’s causing your customers to churn. The reasons can be varied and wide-ranging – the most common ones include poor customer service, a subpar onboarding process, an absence of ongoing customer engagement, no added value, low-quality communications and a lack of brand loyalty. To determine your customer retention success rate and identify areas of improvement, here are some strategies that can help you keep your clients. A fool-proof way of losing a client is for them to think you did not deliver as promised. Selling the house down to close a deal and thinking of the effects longer term is a poor business practice that should be avoided. 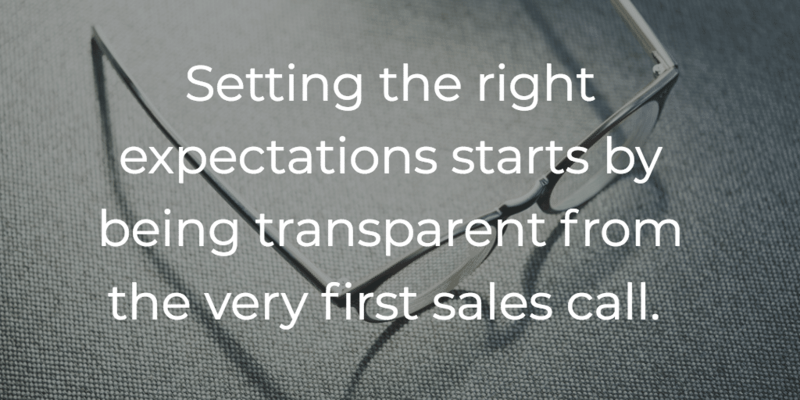 Set the right expectations starts by being transparent from the very first sales call. Ensure your commercial teams are aligned with goal setting and KPIs to avoid mismanaged expectations – by under-promising and over delivering, you will strengthen client trust. Getting started with a new product or service can be confusing, but your users’ first experience is absolutely critical. To ease the transition, set up a world class on-boarding program to guide new customers through your product or service’s features, functionality and process. If done incorrectly, clients lose interest – and fast. Quick learn modules, educational tutorials and webinars can give you complete control over the pace in which you are sharing information. Setting up certifications can also be part of your longer-term client ramp-up. Establishing milestones to support customers during key periods of their client lifecycle (i.e. launch date, onboarding, yearly anniversaries, critical churn periods) is crucial in strengthening your customer relationships. Take time to appreciate customers who are still with your company with incentives, handwritten notes and gifting. A study run by Oracle found that a staggering 89% of existing clients moved onto a competing brand after receiving poor customer service. Reaching out to understand your customers from the outset will highlight potential gaps and red flags that can be addressed in time. Customer Satisfaction Surveys serve as a useful retention tactic to provide customer-driven, operational and strategic direction for your organization and make customers’ voices heard. – Deliver an understanding of the customer relationship and its drivers. – Identify areas of shortfall and prioritize product and service improvement areas. – Explore customer priorities and hypothesize customer personae. Ensure the questionnaire is optimized, short and sent periodically to gather better response rates and accurate data. Use the findings to benchmark client satisfaction. Eventually, analyzing and increasing your Customer Happiness Index or NPS will become a crucial metric to measure the long-term success of your business. Your customers go through different phases after signing up to your service. Whether it’s a long-term user who has remained inactive for a while, a new user that has not yet used your service or a user at risk of churning, segmenting your customers into different groups can help you target them more effectively (i.e. based on their level of engagement, tenure, risk factors and competitive threats). Personalized nurturing communications for each group can foster re-engagement and lead to successful conversion and recovery. Furthermore, ensuring all is tracked in a CRM tool will allow for automated triggers, real time action and reporting to monitor progress. By reaching out to your customers proactively and increasing the frequency of your client communications, you show you’re invested in helping them get the most out of your partnership. If you have a wealth of content (whitepapers, eBooks, collaterals, videos, success stories) that your existing customer base would value, spend some time highlighting your value proposition on both online and offline channels – for instance, via monthly customer newsletters and closed-door events. If you realize they aren’t leveraging all of what is available to them, send them a friendly nudge with the features they might have overlooked and generate additional up-sell/cross-sell opportunities. Rather than redirecting time and resources to retaining all customers on the brink of churning, refocus your efforts to keep the pool of most valuable clients onboard. Successful businesses are generally those that identify said customers, build relationships with them and work to bring in new customers with a similar profile. Retention tactics can range from building a strategic accounts team to launching account based marketing campaigns. Sporadic acts of gifting to your best customers can be a great way to remind them of you These can range from digital gift certificates, branded goodies to more bespoke items. By adding the element of ‘surprise and delight’, unexpected treats can create a powerful and long term bond with consumers. Premium loyalty programs are becoming more sophisticated – marketers are capturing and leveraging the data they find from omnichannel and multichannel programs that recognize customers for every interaction they make with a brand, to both understand and market to them more effectively. In order to make an impact in the loyalty landscape and beat out competition, exceptional customer experiences and investing in personalization should be at the forefront. Studies show that shared values and an emotional connect are the largest drivers of brand loyalty. Here, plastic loyalty program cards might have less of an impact, whilst mobile apps that deliver instantaneous & customized updates, real-time rewards, offer invitations to special events and award ceremonies will make customers feel like a respected part of a community. Clients place high emotional value on these rewards, which in turn strengthens their loyalty to you. The public has become desensitized to the constant bombardment of “buy me” messages and marketing machines. The best marketers for brands are happy customers, which is why advocacy is such a powerful solution for customer retention. Brand advocates don’t turn their backs on you and on average, customers referred by them have a 37% higher retention rate. Advocates work doubly in reducing your customer churn by maintaining their partnership with you and bringing suitable clients your way. To fully realize the potential of word-of-mouth marketing, build a robust customer community with a tool like Influitive or Sociable to facilitate customer collaboration and encourage brand advocacy. Your customers can easily share testimonials, reviews and recommendations to their peers, and incentivizing advocacy marketing actions with a loyalty program is a step you can take to further encourage participation. To thwart churn, you’ll need to let your customers know how much you appreciate their business by thanking them for their continued partnership and support. Publicize how grateful you are to them by featuring them on your social media channels, inviting them to be guest speakers to your events or rewarding them for being a certified partner. There is a direct relationship between Customer Lifetime Value and your business’ success. After all, it’s a lot more profitable to retain existing clients than it is to acquire new ones. For this reason, customer attrition is a critical metric to consider. With the right retention strategies, you can lower your churn rate, increase customer loyalty and drive your business to success.